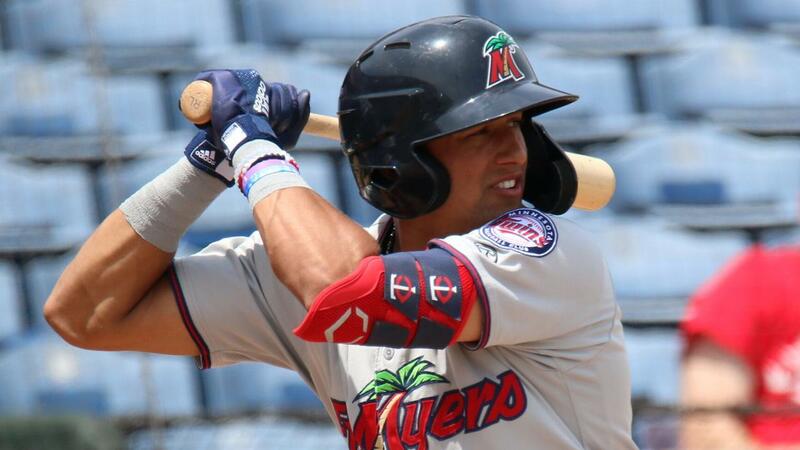 Self-described "slow starter" Royce Lewis is coming around at the plate -- and that's not good news for Florida State League pitchers. Minnesota's No. 1 prospect posted his second consecutive multi-hit game -- collecting three hits and two runs -- as Class A Advanced Fort Myers outlasted St. Lucie, 7-3, on Monday night. "Funny thing is, I felt like I was seeing the ball better for the first five, six games," said Lewis, who was 4-for-19 through the first six games. Despite hitting a home run in his first professional at-bat in the Rookie-level Gulf Coast League on June 26, 2017, MLB.com's No. 5 overall prospect thinks he has a habit of starting off the season slow. "I wish I could change that, but that's just how it is," he said. After his average dropped to a season-low .154 on April 12, Lewis has posted back-to-back multiple-hit games for the third time in the Florida State League and the 12th time in his career, including four in a row last June 14-21 with the Class A Cedar Rapids Kernels. On Monday night, the No. 1 overall choice in the 2017 Draft sprayed the ball around the Jackie Robinson Training Complex. Lewis collected base hits to right and left field and a double to center in his first three at-bats against Mets southpaw Kevin Smith (0-2). He also walked and scored in the ninth. "I feel like if I can stay in the strike zone, I can compete with any pitcher," Lewis said. "You have to take advantage of mistakes. Pitchers are human too. The first few games, I was just missing the mistakes. "Batting second in the order, my favorite spot, I see a pitch and swing at it. Last year, I feel like I took a lot of hittable balls. Now I'm seeing good pitches and putting the ball in play." The 19-year-old shortstop was the youngest player on the circuit last year. After starting the season with Cedar Rapids, Lewis moved up to Fort Myers for the stretch run. He batted .255 with five home runs and 21 RBI in 46 games as the Miracle captured the league championship. Entering Monday hitting .206, Lewis' big night lifted his average to .263. "There is more to helping the team than hitting," said the native of Aliso Viejo, California, who raised his OBP almost 40 points to .442. "I like to control the controllable. I can control how I play defense and help the team every day. "People also forget about baserunning. When I get on base, I cannot think about, 'Oh, I just missed that pitch,' or something that happened in the field. I have to try to score for the team. It's all part of growing mentally, and I continue to grow." Twelfth-ranked Twins prospect Akil Baddoo added three hits -- including a solo home run -- with three runs and two RBIs. No. 16 prospect Ryan Jeffers also had three hits. Randy Dobnak (1-0), a 10-game winner with Cedar Rapids last year, scattered three hits and a walk while striking out four in six innings. The right-hander extended his scoreless streak to start the season to 11 frames. For St. Lucie, Quinn Brodey, the Mets' No. 29 prospect, went 2-for-3 with a walk and a run scored.